INTROIT As newborn babes, alleluia: desire the rational milk without guile. Alleluia, alleluia, alleluia. (I Pet II. 2.) Rejoice to God our helper: sing aloud to the God of Jacob. (Ps. LXXX.) Glory, &c.
COLLECT Grant, we beseech Thee, Almighty God, that we, who have completed the paschal solemnities may, through Thy merciful bounty, ever retain them in our life and conversation. Through. 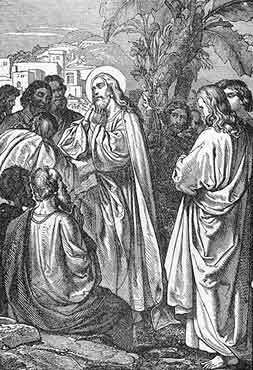 INSTRUCTION As in his gospel, so in his epistles, and especially in this, St. John proves the divinity of Christ which had been denied by some heretics. He says that Christ had come to purify all men from sin by water and blood, that is, by. His blood shed on the cross for our rec­onciliation, and by the water of baptism to which He has given the power, the divine effect of His blood, and has thus proved Himself the divine Redeemer. This His divine dignity is attested by the Holy Ghost who lived in Christ and worked through Him with His fulness, and when sent by Him after our Lord's Ascension, produced most won­derful effect in the apostles and the faithful. As now on earth three, the Spirit, water, and blood, give testimony of Christ's divinity and agree in it, so also in heaven three, the Father, who calls Him His beloved Son, (Matt, III. 17.) the Word, or the Son Himself, who wrought so many miracles, the Holy Ghost, when He descended upon Him at the baptism in the Jordan, (Luke III. 22.) give testimony of His divinity, and these also agree with one another in their testimony. If Christ is truly God, then we must believe in Him, and this faith must be a living one, that is, it must prove fertile in good works, and this faith conquers the world by teaching us to love God above all, to despise the world with its pleasures, and to overcome it by indif­ference. Let us strive to have such faith, and we shal overcome all temptations and gain the eternal crown. ASPIRATION O Lord Jesus! strengthen me by a lively faith in Thy divinity, so that I may not suc­cumb in the spiritual combat against the world, the flesh, and the devil, and be eternally lost. �nd resurrection, has made peace between God and man, and that His fol­lowers should be known by their harmony. (John XIII. 35.) There is a threefold peace: peace with God, by avoid­ing sin; peace with ourselves, that is, a good conscience; peace with our neighbor, by the exercise of charity. This threefold peace is necessary for our salvation. That is true faith which firmly believDõ=ll that God has revealed, whether written or unwritten, and when one lives in accordance with that faith; for faith in Jesus simply does not save us, when that which He has commanded is not performed. (Matt VII, 21.; James II. 20.) That faith is meritorious which without doubting and without hesitation willingly submits the understanding to revealed truths which it cannot comprehend, and this for the love of Gods who is eternal truth and cannot deceive. The Council of Trent (Sess. V. in the Introduction) assigns the Catholic faith as the one without which it is impossible to please God, and the Roman Catechism teaches: (I part. art. 9.) "The Church is also called Catholic or Universal, because all who desire eternal salvation must cling to, and embrace her, like those who entered the ark to escape perishing in the flood." According to this doctrine of the Church, which the holy Fathers affirm, only those idolaters and obstinate heretics are excluded from salvation who knowingly deny the truth, and will not enter the Church. The Catholic Church does not condemn the unbelievers, she prays for them, leaves judgment to the Lord, who alone knows the heart, and knows whether the error is culpable or not, and she calls on all her, members to pray for their enlightenment.